Mike and I have had an unconventional relationship. To be fair, it all started rather conventionally: we were introduced by a mutual friend and colleague who thought our love of aviation and basketball would be a good fit. There was just the minor detail of a few thousand miles separating us; Mike has a house in Calgary and I live in Toronto. After numerous emails, phone calls, and texts our first face-to-face date was at an airport hotel restaurant as Mike was passing through town. After that, there were lots of weekends back and forth across the country and multiple destinations in between as we tried to spend as much time together as our basketball coaching schedules would allow. It seems rather fitting then, that Mike would propose while we were on vacation together. We were in St. Lucia and he could barely contain his desire to give me the ring that was clearly weighing very heavily on his attention. Needless to say, the rest of the trip we basked in the warm glow of engagement under the Caribbean sun. As soon as we got back from our trip, planning began in earnest. We quickly decided on Ottawa, my hometown, in the fall the following year. Picking a venue was relatively straightforward, Ottawa has a number of beautiful locations but I had attended a University social at the Museum of History and I was struck by the floor to ceiling windows and the beautiful totem poles. Choosing a photographer was an important decision and the glowing online reviews for Union Eleven drew us to them. After hearing Davey was available and seeing his portfolio, we were very excited about our choice. Davey was able to accommodate meeting us via online video with him in Ottawa, Mike in Calgary, and me in Toronto. We knew after that meeting he was the person we wanted to shoot our wedding. Once the big day arrived, Davey and Amanda were rock stars! They made us feel so comfortable and relaxed. They managed to get amazing pictures without anyone even realizing they were there. We really wanted to capture candid moments throughout the day and Davey and Amanda didn't disappoint. 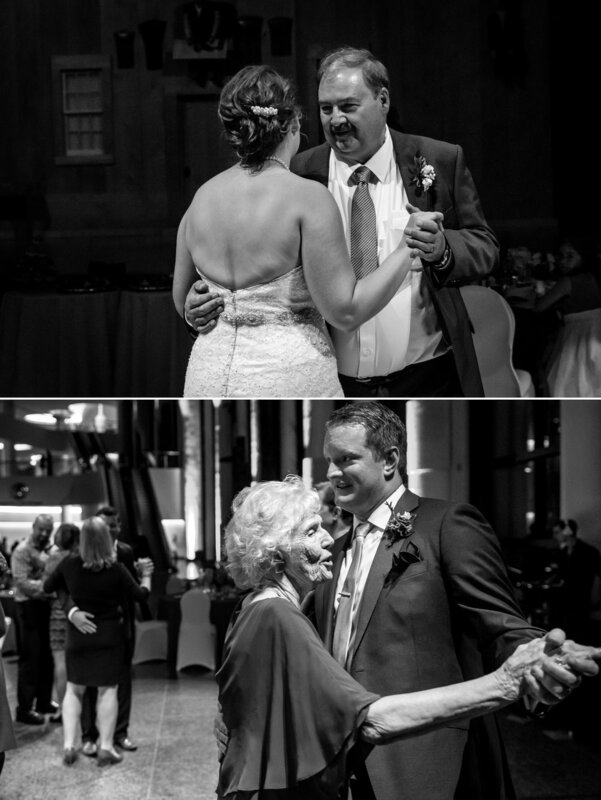 One of the highlights was the surprise Mike and his mom had in store for their dance. Mike’s mom had wanted to bring a bit of the West to the party so she asked all of the guests on Mike’s side to learn the Cadillac Ranch line dance. Mike and his mom donned their cowboy boots and started off and then everyone else joined in. Davey and Amanda were all over the dance floor capturing amazing shots of a very special moment. As we look back on our wedding, we’re overwhelmed by the story Davey and Amanda were able to tell through the pictures they took. They will be memories we will cherish forever.